With the Flat turf season on the horizon, punters may be holding ante-post wagers (keen to see if the price has shortened) or just intrigued to see how the market is shaping up. Frankel Blog is only interested in one aspect of this Classic taking place at Newmarket on Saturday 5th May 2018. Obviously, it is those three-year-olds sired by Frankel. I wasn't sure how many colts/fillies would hold an entries at this stage. This well-bred son of Frankel is out of star performer Attraction, who won the 1000 Guineas among many notable races. 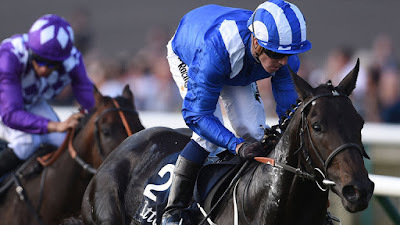 Elarqam has won both his two starts to date (10/11f & 11/8f). A lovely debut effort when staying on strongly at York. Then ''eased close home'' when taking the Tattersalls Stakes (Group 3) at Newmarket. Both races where over 7f. He is priced 14/1 to win the 2000 Guineas for Mark Johnston in the ownership of Hamdan Al Maktoum. Roger Charlton is a class trainer and very selective with Group entries at two. It is worth noting this son of Frankel who is out of African Rose, made his winning debut at Ascot in September. Never a bad sign for this stable and leading owner K Abdullah. The 11/10f was giving a ''promising'' tag when beating Wadilsafa who has a reputation himself as a talented horse. Herculean is priced 25/1 to win the 2000 Guineas. Saxon Warrior is favourite at 5/1. This son of Deep Impact - trained by Aidan O'Brien - has won all three starts to date including the Racing Post Trophy Stakes (Group 1). He has achieved prize winning of £191,937.